The intestine-specific transcription factors CDX1 and CDX2 are important for directing intestinal development, differentiation, proliferation and maintenance of the intestinal phenotype. 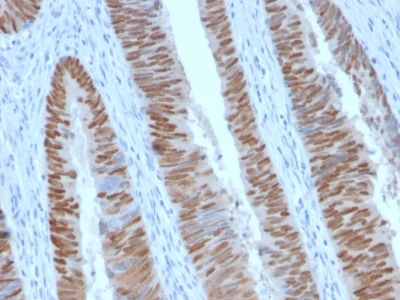 CDX2 protein expression has been seen in GI carcinomas. Anti-CDX2 has been useful to establish GI origin of metastatic adenocarcinomas and carcinoids and is especially useful to distinguish metastatic colorectal adenocarcinoma from lung adenocarcinoma. However, mucinous carcinomas of the ovary also express CDX2 protein. It limits the usefulness of this marker in the distinction of metastatic colorectal adenocarcinoma from mucinous carcinoma of the ovary. Antibody with azide - store at 2 to 8 degree C.
Antibody without azide - store at -20 to -80 degree C.
Antibody is stable for 24 months. Non-hazardous. No MSDS required. Small volumes of anti-CDX2 antibody vial(s) may occasionally become entrapped in the seal of the product vial during shipment and storage. If necessary, briefly centrifuge the vial on a tabletop centrifuge to dislodge any liquid in the container`s cap. Certain products may require to ship with dry ice and additional dry ice fee may apply. Immunohistology (Formalin-Fixed): 1-2ug/ml for 30 min at RT; Staining of formalin-fixed tissues requires boiling tissue sections in 10mM Tris with 1mM EDTA, pH 9.0, for 10-20 min followed by cooling at RT for 20 minutes. 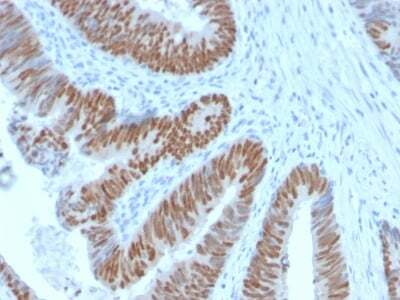 Formalin-fixed, paraffin-embedded human Colon Carcinoma stained with CDX2 Rabbit Recombinant Monoclonal Antibody (CDX2/2951R). 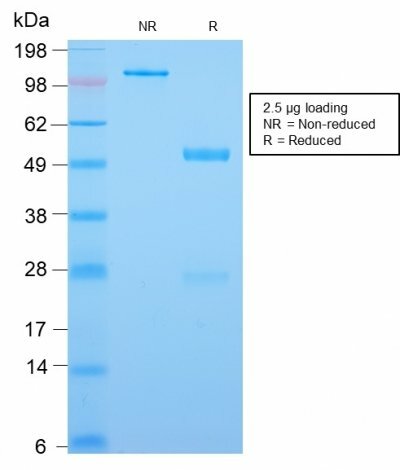 SDS-PAGE Analysis Purified CDX2 Rabbit Recombinant Monoclonal Antibody (CDX2/2951R). Confirmation of Purity and Integrity of Antibody. NCBI/Uniprot data below describe general gene information for CDX2. It may not necessarily be applicable to this product. Silberg, D.G., et al. 2000. Gastroenterology 119: 961-971.; Mallo, G.V., et al. 1998. J. Biol. Chem. 273: 14030-14036.